Nineteen Sixty-four: Something about the Name Mary? Something about the Name Mary? Pope Benedict XVI recently encouraged Catholic parents to consider a Christian name (e.g., biblical or saint name) for their children. The Social Security Administration maintains a website that tracks the names given to children in America. The most recent listings for the top boy and girl names show that Americans still tend to give children biblical or saint names. However, there are exceptions in the top ten such as Jayden for boys (#8) and Madison (#7) for girls. The top name for boys in 2009 was Jacob and for girls it was Isabella. Where is Mary? Not in the top ten. From 1910 to 1965 Mary was either the #1 or #2 name for girls in the U.S. In 2009, this name dropped out of the top 100 for the first time (currently #102). By comparison, Joseph has remained consistently popular. 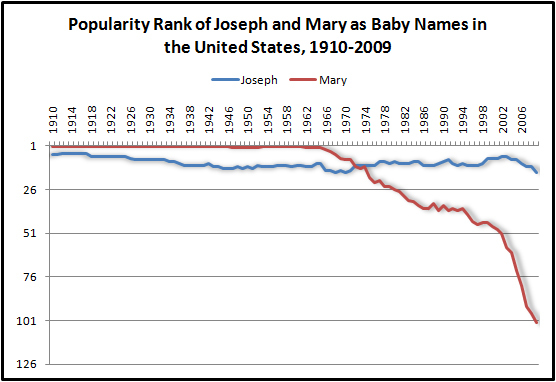 Although at #16 in 2009 this is the lowest rank for Joseph since 1910. 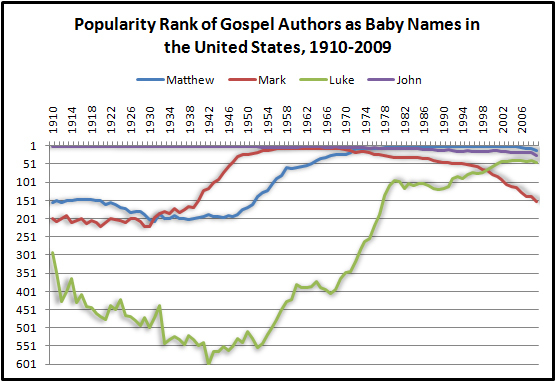 The names of Gospel authors have historically been popular boy names but there is considerable variation over time. The most consistently popular name has been John which was in the top ten from 1910 to 1972. Currently John is ranked #26. At the same time John exited the top ten Matthew entered the most popular group. Currently Matthew is just outside the top 10 at #13. Just as Mary has become harder to find, Mark has also fallen out of favor. Mark was a top ten name from 1955 to 1970 but fell out of the top 100 in 2003 (currently #154). Luke has had the biggest rise in popularity since 1910 and it's not just a "Star Wars" effect. In 1950 Luke was the #511 boys name. It rose to #222 in 1976 (a year before the release of Star Wars). Luke entered the top 100 in 1993 and has remained there since (#48 in 2009). For more on names, and specifically names given by Catholic parents, see "Don't Call Me Ishmael" by CARA researchers Paul Perl and Jon Wiggins in the Journal for the Scientific Study of Religion. Here they found, "worship attendance does increase Catholics' likelihood of choosing specific names that are disproportionately common within their tradition. This suggests that committed Catholics perceive certain names as 'Catholic' and represents one instance in which names do retain religious connotations for believers. We are aware of no previous research that has established such a link between parental religious commitment and naming" (p. 209). They estimate that 50% of females named Mary (or Marie, Marion, Maria, Maryann, etc.) in the United States were raised Catholic (p.221). Females with the following names were least likely to have been raised Catholic: Tamara or Tammy (14%), Shirley or Shirlene (15%), Bonnie (16%), Brenda (16%), and Joyce (18%) (p.222).